The lady, I’ll call her Kathleen, in this example (an actual client) was aged 91 at the time she entered care and was in good health, both mentally and physically, but was suffering from acute Osteoporosis. Kathleen could no longer stand-up straight and really struggled with a whole range of activities of daily living. Initially, she managed in her own home with professional help in the morning and evening, but, of her own volition, decided that she needed residential care. Kathleen came from an extraordinarily long-lived family as her Mother and both of her Mother’s sisters lived to be over 100 and she assumed she could well have an equally long life. As a pensioner, Kathleen was fairly comfortably placed; her income, which included her State Pension, the Attendance Allowance and a Widow’s occupational pension, was £20,000 per annum net. However, the care home she selected in Kent, at the time, was £1,000 per week, leaving her with a shortfall of income over expenditure of £32,000 per annum. Having sold her flat and collected together her lifetime savings, Kathleen had £300,000 available, from which the additional income had to be generated – a return in excess of 10% per annum after taxation and charges. Had the return been half of this or less, a fairly standard high income portfolio may have sufficed without exposing the capital to excessive investment risk. However, a return in excess of 10% per annum is impossible to obtain with any degree of certainty. It is not just the initial cost of care that we need to consider, it is also the amount by which those costs will increase in the future. In the recent past, care costs tended to increase faster than inflation; Collier International, which publishes regular reports on such matters, commented in autumn 2014 that, over the 10-years from 2003 to 2013, fees in the Personal Care Sector had risen by 14.4% in real terms, i.e, over and above inflation. Consequently, the problem for the financial planner is not only generating a high, sustainable return, but also seeking to increase that return to keep pace with care cost inflation. In Kathleen’s circumstances, traditional investment methods alone are unlikely to produce the desired result, so a more extreme approach is needed. An Immediate Needs Plan – an immediate needs annuity – is a specialist form of impaired life annuity designed specifically to pay care costs to a registered care provider. An annuity is a guarantee from an insurance company to pay an income for life, however long that may be, in exchange for a non-returnable lump sum. An “impaired life” annuity takes into account not only the age of the intended annuitant, but also their state of health, so the result is specific to their situation. In Kathleen’s circumstances, the cost of buying an immediate needs annuity, which was guaranteed to not only pay £32,000 per annum for life, but also for that income to increase by 5% per annum, was £157,657. Buying the above annuity and investing the balance for growth at an assumed return of 4% per annum net of charges and taxation, which is not guaranteed, but is felt to be a reasonable assumption for a relatively low-risk portfolio. Investing the full £300,000, again assuming a net return if 4% per annum, but withdrawals taken from this fund to pay for the care, with those withdrawals increasing at 5% per annum. So, the magenta line running down from the left to the right represents the diminishing balance of Kathleen’s savings, with those savings running out before she attains the age of 100. 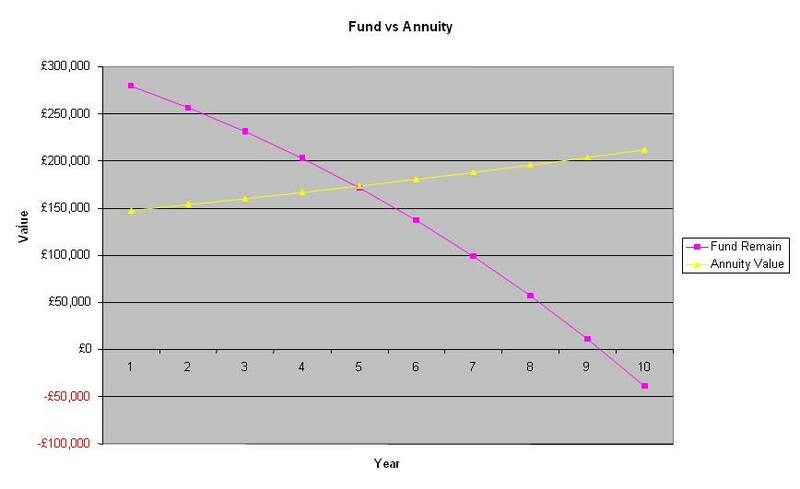 The yellow line running up from the left to the right represents the growing value of Kathleen’s remaining savings, following purchase of the annuity. It is assumed that a combination of the annuity and Kathleen’s continuing income will be sufficient to meet her care costs and that no further withdrawals are needed, but this is not guaranteed. Incidentally, the income is highly tax-efficient from Kathleen’s point of view because it is paid entirely tax-free, being deemed to be a trading receipt of the care provider. Whilst the example here is Kathleen entering a care home, but the same planning approach is available to those choosing to have care provided in their own home and self-funding that care. In the above case study, it could be inferred that there is a “rule of thumb” that the cost of an annuity, on average, is around 5x the income shortfall. It is decided on a case-by-case basis by underwriters and could be more or less than this. As Kathleen had full capacity, she could make the decision herself as to what she wanted to do with her money, but she involved her two Daughters and Granddaughter, who were the beneficiaries under her Will, in the decision process. Kathleen’s overriding desire was to stay in the care home she had selected for the rest of her days and she knew, if she ran out of money, Kent County Council would not fund that level of care cost. Also, Kathleen knew that none of her family could afford to pay third-party top-ups. The family concurred with this view and were, in any event, delighted that Kathleen’s care was guaranteed to be funded however long she lived and there was still something of an inheritance for them upon Kathleen’s death. Had Kathleen not had the capacity to make her own decisions and the family was responsible for making the decision for her under a Power of Attorney, it is important to remember that the duty of care of an Attorney has to be to the Donor of the power – Kathleen in this case – without any self-interest. When I am discussing these matters with clients or attorneys, I take the view that my role is merely to enable people to arrive at an informed conclusion, so I will never recommend either route – investment or annuity. The fee Wren Sterling will charge is the same regardless of which option is chosen, so that there is no bias in the process. The initial review process is at the expense of Wren Sterling, but a modest fee will be charged to produce a detailed report which includes a specific comparison along the lines of the example in this article. That report will also explore the options available at the outset, including no indexation of benefits, a deferred start to the annuity payments and enhanced death benefits. It must be remembered that the value of investments can fall as well as rise as can the income derived from those investments. If withdrawals exceed the total return from an investment portfolio the capital will be eroded. This erosion can become exponential, as reduced returns mean that more of the original capital has to be withdrawn, which further reduces the potential returns, and so on. Sometimes known as "pound cost ravaging"!